The first spike is World War II, after which we gradually got our act in order, then we start to get cooking through the 1980s in Regan’s neat little yearly oscillations, turn things around under Clinton a little again, crank it up under George W. Bush, and it really starts to spike under Obama. Terrifying. 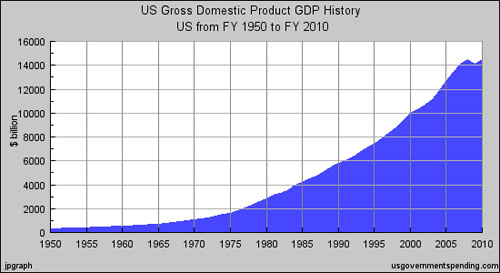 So, yes, we have not yet reached the historical high of national debt per GDP. But we are dangerously close. Remember that during World War II, we had rationing, a draft, restrictions of civil liberties, and all sorts of things that helped the government mobilize the nation’s economic output for the war effort. What we have today, arguably, is 20+ years of an economy built on a series of bubbles, most recently a huge debt bubble. 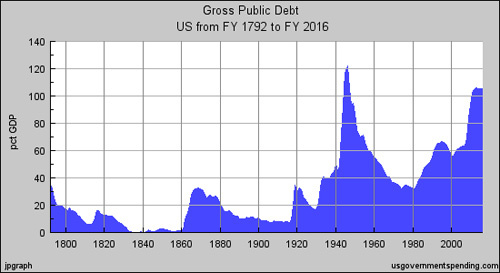 You’ll notice in the graph above that the debt levels off. But that leveling off is based on the Congressional Budget Office’s projections, which are quite a different animal from historical numbers. In fact, the peak on the graph comes in 2013, and the leveling off begins in 2014 or 15. Not encouraging. None of which is to say that we’re doing the wrong thing by aggressively borrowing in the interest of fixing the economic mess. But I think that people like Paul Krugman, who for months has been writing a weekly screed about how idiotic our politicians are for giving lip service to prioritizing debt reduction higher relative to economic stimulus, should grapple with this reality a little bit. 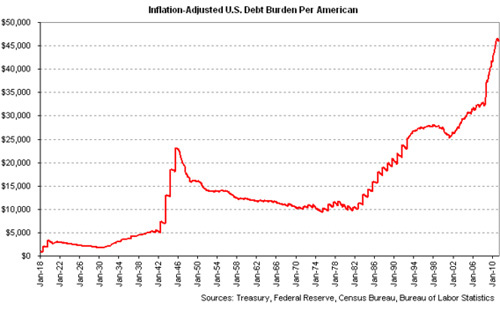 Acknowledge that while our debt is not technically at a historical high point, it is indeed very very high. And frame his argument for why we should be increasing it at an even steeper rate in terms that are proportional to the scope of the problem. Can you fix the budget? Right now, a 7-year old girl in India is dying, and it’s because you’re buying a Toyota Prius. Read on to see why this is true, and what it has to do with the future of environmental policy for the planet. Al Gore will go down in history as a pivotal figure in helping the human population realize that it’s wreaking havoc with the planet’s temperature, and helping set us on the path to correcting the problems. However, it is an intellectual fallacy to thing that because the man is right about the problem, he must also be correct about the proper solution. We have serious problems, and we need some major solutions. I could try to convince you that we should be glad that Al Gore isn’t setting world policy on this stuff, but that’s not really necessary, since there isn’t even a remote possibility of that happening. So I’ll instead try to convince you that you don’t need to worry quite as much as you have been about global warming. But first a brief and semi-obvious point about politics. We don’t have a King of the World. Boy don’t we. We have a couple of hundred sovereign countries on this planet, and whatever happens has to deal with the millions of political realities that come into play as these countries try to work together. (And yes, game theory comes into play here — if China thinks the US is doing something about reducing carbon emissions, their incentive to reduce their own emissions is lessened. Etc, etc, etc.) So, sometimes it’s useful to talk about environmental policy as though you could snap your fingers and make anything World Law. But at some point in your discussion you need always to come back to political and economic reality. Okay, so here’s the doomsday scenario that has been painted for us: the world is on the brink of massive environmental change that will cause myriad changes, both predictable and unpredictable, and be catastrophic for the human race. Furthermore, we may be on the edge of a Tipping Point™, wherein after a certain point it will be too late for us to do anything. 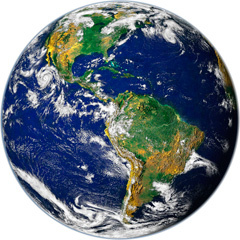 Therefore, despite scientific uncertainty1 about the exact rate and effects of global warming, we need to Error on the Side of Caution, and take drastic steps to cut our carbon emissions and generally live in a much different way than we have been. It’s not the planet that needs saving. The world has been through major environmental upheaval over and over in its history, and generally everything comes back better than before eventually. What we’re talking about saving is the human race. Maybe. More likely, we’re talking about an outcome that would create massive problems for some percentage of the world’s population at some point in the future. Bad enough, but the distinction is worth remembering. Even the most grandiose solutions being bandied about, the ones that cost on the order of tens or hundreds of trillions of dollars, are not going to solve the problem. They reduce the rate of increase in temperatures — reversing those changes is farther off than what we’re talking about today. I love Malcolm Gladwell just like everyone else, but generally the concept of a tipping point is overstated when talking about most phenomena in the world, and this is likely the case with regard to the environment too. Scientists have a track record of overstating environmental emergencies, and overstating the extent to which these emergencies cannot be corrected once they’ve occurred. In my lifetime we’ve seen several supposedly-irreversible ecological disasters reversed after some human effort was expended towards fixing the causes. Bird populations were practically eradicated in the Everglades around 1990; today they’re restored and fine. Acid rain was a scourge on the US in the 80s; today its unheard of. Chernobyl today is a nature preserve where wild animals happily roam as they hadn’t for decades, because people have left it alone. The environment is self-correcting to a greater extent than we often realize. We are doing stuff about the environment. Political opinion worldwide is shifting (even in the US, which remember is the only nation in the world that didn’t sing the Kyoto Protocol), and “green technologies” are being developed and refined all the time. These two things feed each other — as people become more conscious of damage to the environment, they become more willing to adopt sustainable technologies. And as the demand for these technologies grows, they will become even more profitable, affordable, and ubiquitous. China is developing green tech, and it’s out of a pure profit motive — they know that they’ll be able to sell it to the Americans. In addition to this incremental improvement in pro-environment technology, there are bound to be technological sea-changes that make drastic improvements in ways we can’t envision right now. We can’t assume that they will make the problem disappear overnight (the way, for example, the horse manure problem was solved overnight), but we can expect that they’ll make significant improvements that are today unpredictable. If bad comes to worst, we have quick and dirty solutions to global warming that we can deploy. Yes people, it’s geo-engineering. The concept is simple: you pump sulfur dioxide or something into the atmosphere to shade some of the sun’s light from hitting the earth. It’s not pretty, but it works. Volcanic eruptions cause temporary global cooling, and there are things we could do to replicate those effects. It’s best not to talk about this stuff too much, because it undermines the impetus for the more substantial change that we need, but it’s good to know it’s there as an emergency brake. When it comes, the damage we’re talking about will boil down to economic damage, right? People being displaced, food shortages, etc. You can put this stuff in economic terms, and you need to put it into economic terms, so that you can compare the cost of the solution to the problem today with the cost of the solution to the problem in future money. And this is where it gets complicated. The world is getting richer all the time, so that future money is a lot cheaper then today’s money. At least economically, a problem that can be fixed for $10 trillion today is not worth fixing if it can be fixed for $100 trillion in 100 years. The reason for that brings me back to the starving 7-year old in India and your Prius. We have massive problems in the world today. In fact, 16,000 children die every day of starvation. Millions of people die every year of easily preventable diseases like malaria. There are more slaves in the world today then at any other point in history. The list, I don’t have to tell you, goes on. Money spent on some of these problems often goes a long way towards saving and improving the lives of real people living and dying today. So when we spend money on improving the environment of the future, we need to be aware of what we’re not using that money for right now. If you have an ounce of compassion in your body, you need to look at these opportunity costs with clear eyes. Is it better for you to buy a Prius, or to buy a Yaris and donate the difference to Oxfam? Is it better for the world to spend tens of trillions trying to reduce carbon emissions, or should we direct big chunks of that money towards fixing the very real problems that we have right now in the world today? Update: In today’s Wall Street Journal, Bjorn Lomborg touches on many of these same notes (with some interesting specific figures), which makes sense, since his Ted Talk from a few years ago is what started me thinking down this path. Here’s a bizzaro idea — Invest in a human being. You: a rich person. Them: broke but very promising. The terms: You give them a big chunk up front for a percentage of their pay for the rest of their lives, maybe with a buy-out clause. This is perfectly reasonable as a thought experiment, but it’s also a slightly creepy real thing that actually happens, with actual contracts and numbers and I guess audits. Not related, but fun anyway: how to sell a dollar for more then a dollar, and what it means for politics.